With nearly 60 years’ experience, our processes are refined to ensure our clients and customers receive the freshest, tastiest wild oysters while we still lead the way in sustainable harvesting and environmental management. 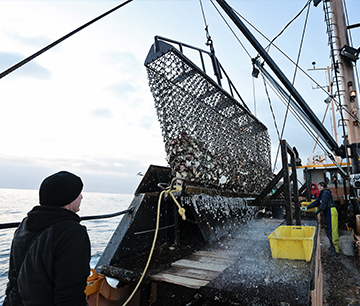 Our Wild Bluff Oysters are dredged by local oystermen from deep beds in the cold seas of Foveaux Strait. 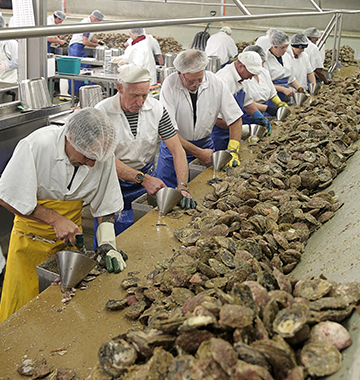 To ensure optimum efficiency, freshness and flavour, the oysters are hand sorted immediately by boat crew before returning to the Port of Bluff ready to be immediately transported to our processing factory. In the interest of the fishery, we harvest well above the legal minimum size of 58mm diameter, with all catch smaller than 62mm diameter being returned straightaway to sea. We carry out all processing in our purpose built factory in Invercargill, just 25km from Bluff. Our wild oysters arrive at the factory fresh and chilled within an hour or two of being dredged. They are then opened, hand sorted and carefully washed in saltwater brine before being chilled and packed ready for distribution. All our products are carried by reliable and recognised transport companies, chilled in polystyrene bins to regulation temperatures and delivered on schedule. To ensure the best product possible, we take pride in the execution of our New Zealand Food Safety Authority risk management plan. Our specialised food safety requirements for bivalve molluscan shellfish see us working in a clean, hygienic environment. Our emphasis on safety and temperature control allows our fresh wild oysters to be consumed in their natural and delicious raw state. Just as we do, you should always keep our products refrigerated and take note of the use by dates clearly marked on individual pots.